I AND THOU is one of the most important books of Western Theology. In it, Martin Buber, heavily influenced by the writings of Nietzsche, unites the proto-Existentialist currents of modern German thought with the Judeo-Christian tradition, powerfully updating faith for modern times. 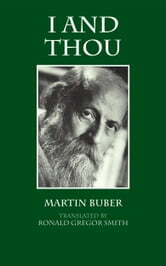 Since its first appearance in Germany in 1923, this slender volume has become one of the epoch-making works of our time.This work is the centerpiece of Buber's philosophy. It lays out a view of the world in which human beings can enter into relationships usung their innermost and whole beings to form true partnerships. This is the original English translation, and it was prepared in the author;'s presence.